My BFF John made this recipe for Thai Supper Club in the fall. It was so amazing, we tore it up. The marinade couldn’t be simpler. The flavors just meld together perfectly. If you aren’t a fan of spicy things, tone down the amount of Sriracha you use. 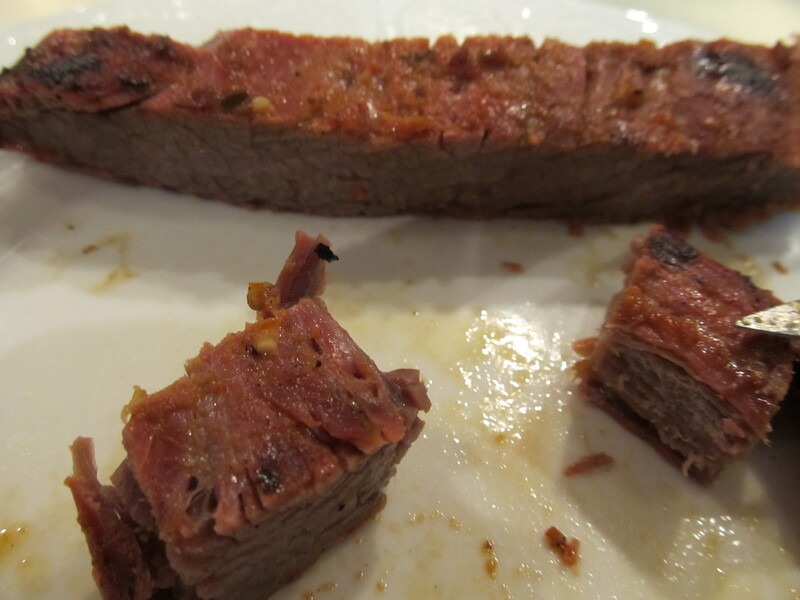 The longer you marinate the meat, the tenderer it is. 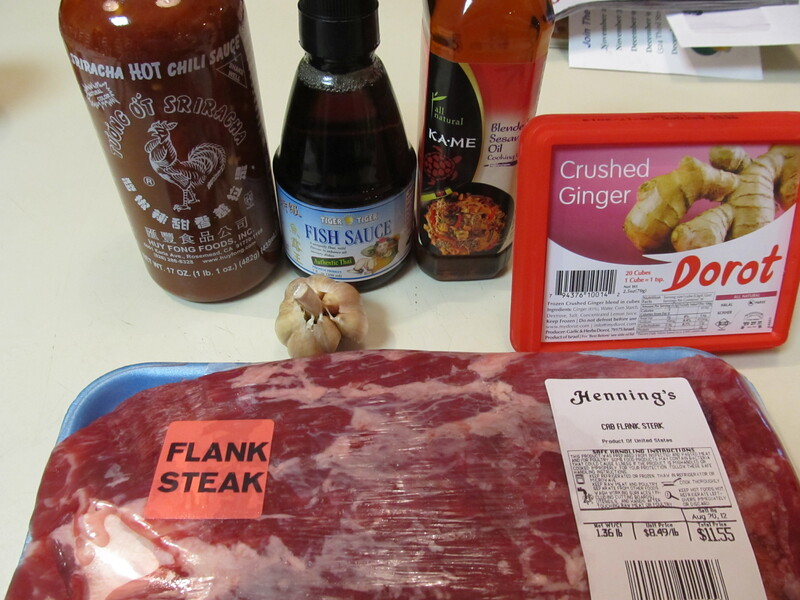 As you know, with flank steak, you MUST marinate it for a couple hours at least. What really brings this meat home is the taste of the grilled meat. OMG I cant really describe it – you just need to make it so you can tear it up!! 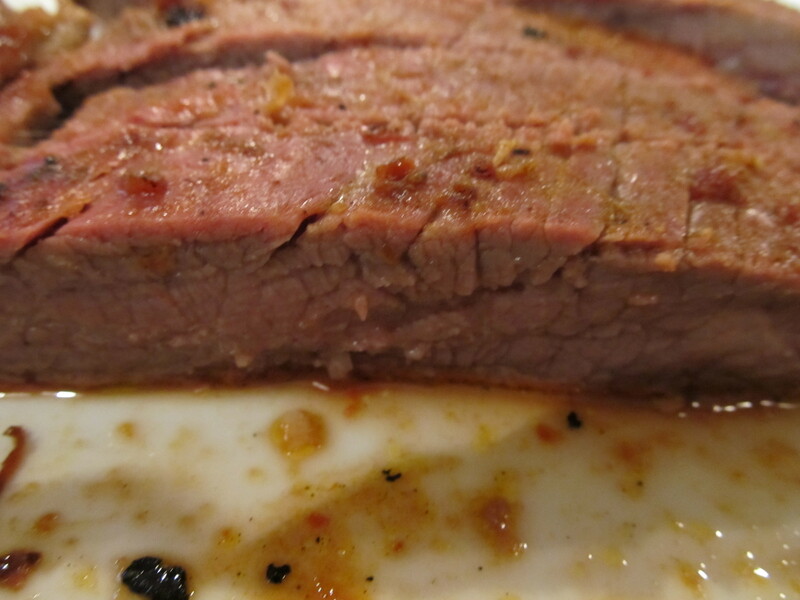 John got this recipe from AllRecipes.com and I highly encourage you to try it for a simple BBQ or get-together. What could be easier – a simple marinade, throwing meat on a grill, then enjoying a fabulous meal??? In a medium bowl, whisk together chili sauce, fish sauce, sesame oil, ginger, and garlic. Set aside a few tablespoons of the mixture for brushing the steaks during grilling. 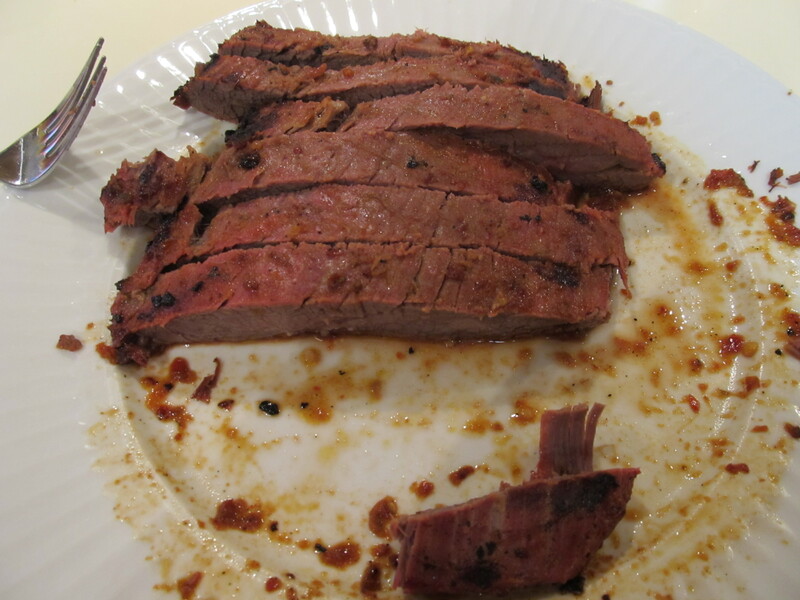 Score flank steak and place in a shallow dish. Pour remaining marinade over the steak, and turn to coat. 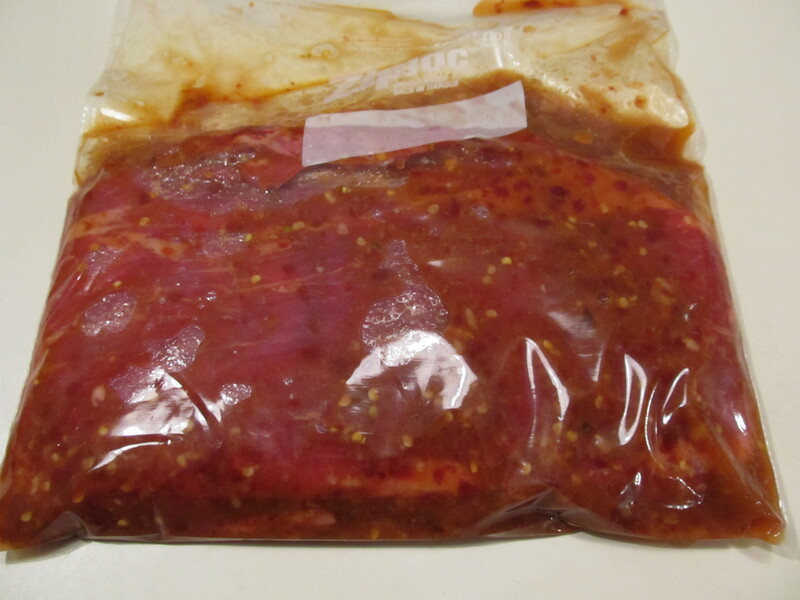 Cover, and marinate in the refrigerator at least 3 hours. Lightly brush the grilling surface with oil. Grill steak 5 minutes per side, or to desired doneness, brushing frequently with the reserved marinade mixture. It’s almost blackberry time! I love this time of year, PERIOD, for so many reasons!!! But it’s always great when berries start to come into season. I wanted to have a simple dessert to showcase the abundance of blackberries (and raspberies) I had in my fridge. 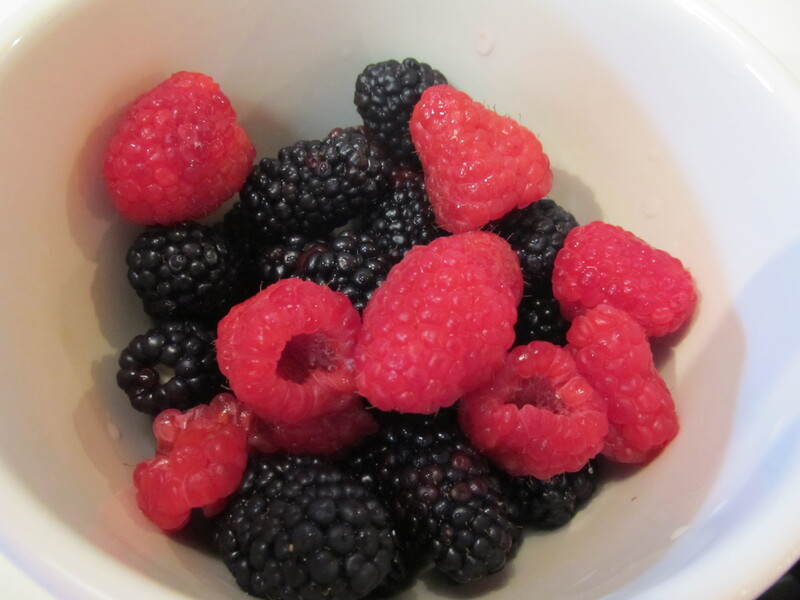 Raspberries and Blackberries – beautiful! Spectacular berries…..dont you just want to stick your face in the bowl? This cake goes together so easily – and uses buttermilk, along with basic ingredients you have in your pantry. Doesnt that look beautiful before it’s even baked? And then it looks even more amazing when it’s cooked! It was so moist and delicious. We made 2 cakes and just sprinkled with sugar prior to baking. Since this cake is more of a casual brunch/afternoon cake, it doesn’t need icing. 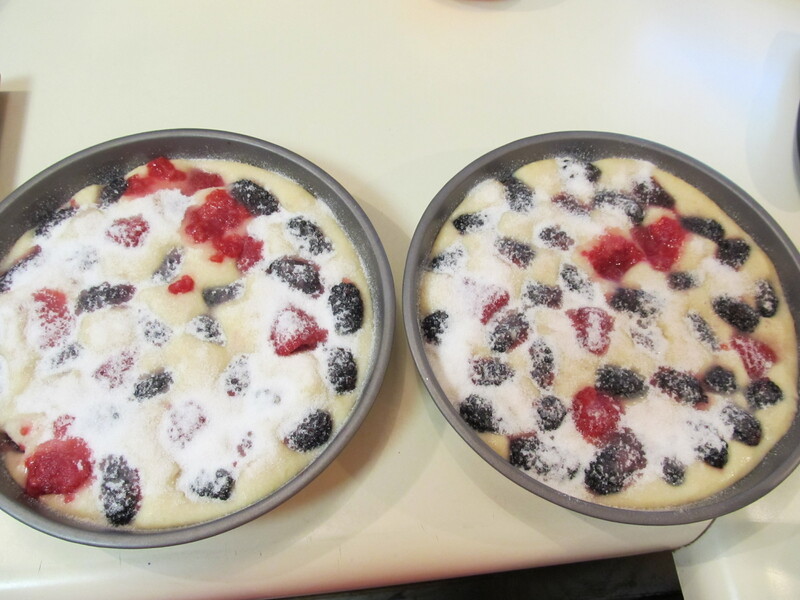 The sugar on top was all it really needed to accompany the moistness of the cake and sweetness of the berries. You can also top with whipped cream and more berries. Preheat the oven to 400°. Butter a 9-inch-round cake pan and line the bottom with parchment paper. Butter the paper. In a small bowl, whisk the flour, baking powder, baking soda and salt. 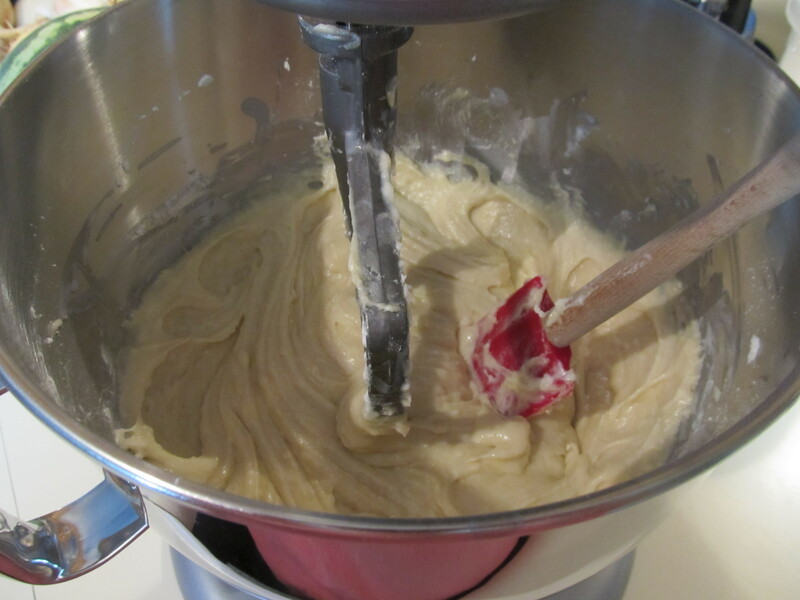 In a large bowl, using a mixer, beat the butter with the 2/3 cup of sugar at medium-high speed until fluffy, 3 minutes. Beat in the egg and vanilla. At low speed, beat in the buttermilk and dry ingredients in 3 alternating batches, ending with the dry ingredients; do not overbeat. 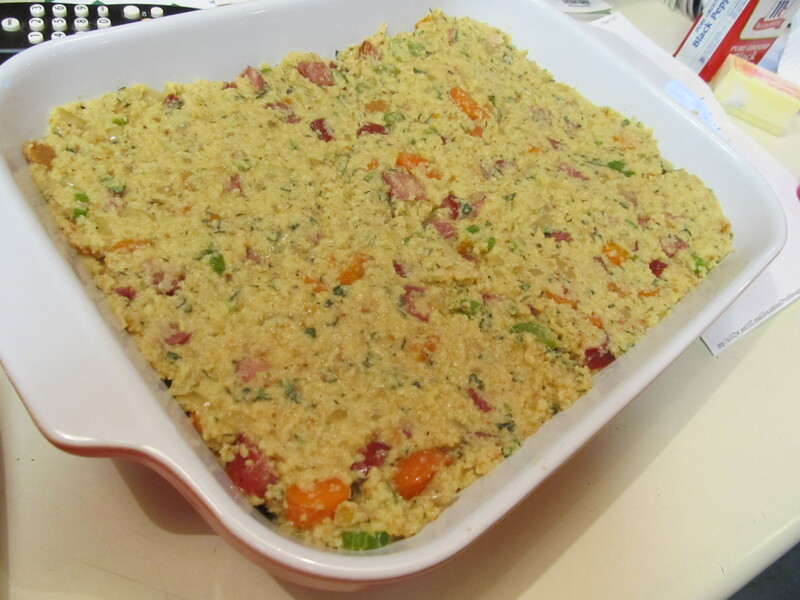 Gently fold the batter just until blended, then scrape into the pan and smooth the top. 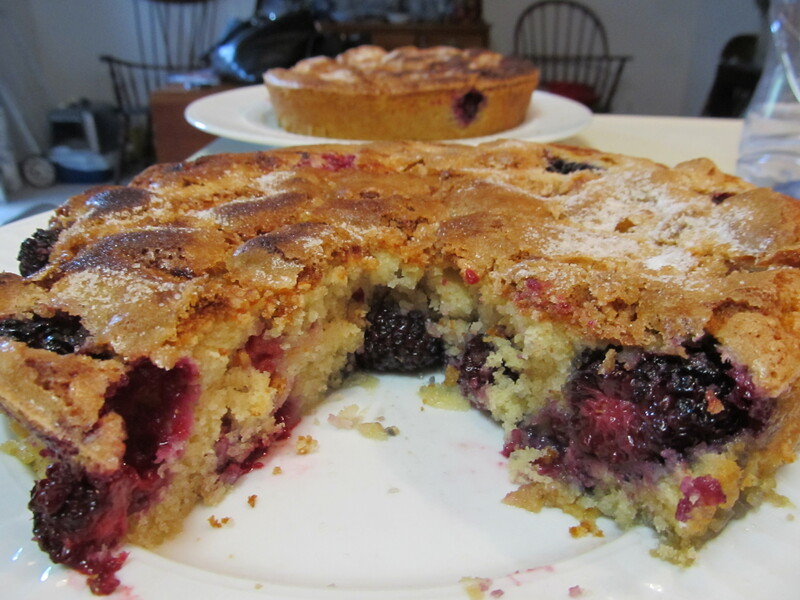 Scatter the 1 1/4 cups of blackberries over the batter; lightly press them in. 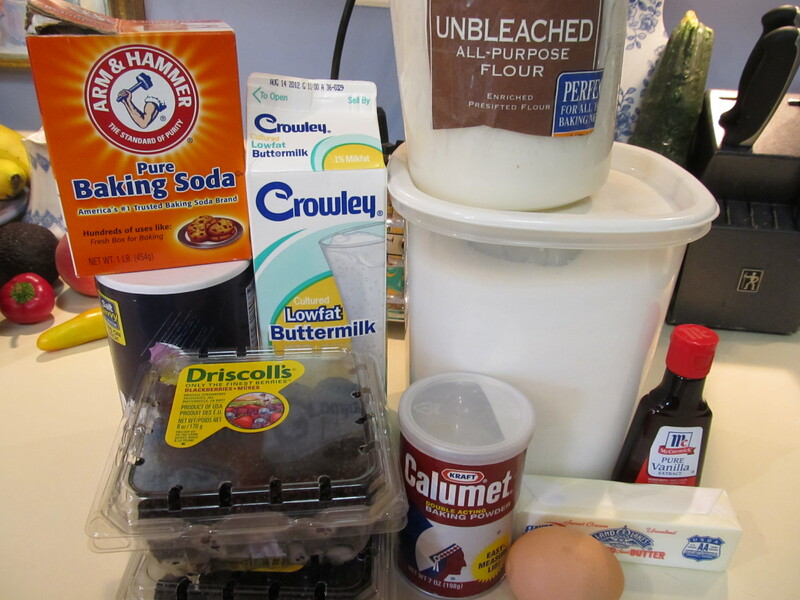 Sprinkle the remaining 1 1/2 tablespoons of sugar over the cake. Bake for about 30 minutes, until a cake tester inserted in the center comes out clean. Transfer the cake to a rack to cool for 10 minutes. Turn out the cake and remove the paper. Turn the cake right side up and let cool completely. 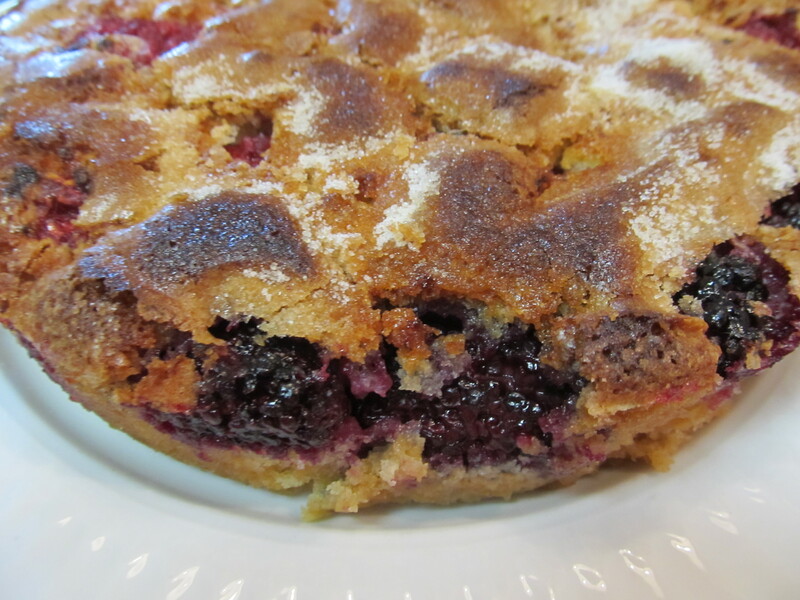 Serve with whipped cream/powdered sugar and more blackberries. My brother Marty has been DYING to get a spot on my blog. He has been wondering why I haven’t included any of his fabulous dishes here…..And I told him that I don’t really have any of his recipes that he makes in order for me to make them myself for the blog. But then I realized that I was wrong. He introduced our family to something delicious about 5-6 years ago on Thanksgiving. He showed up with the stuffing. This Bobby Flay stuffing was off the hook. We hadn’t had anything like it before. 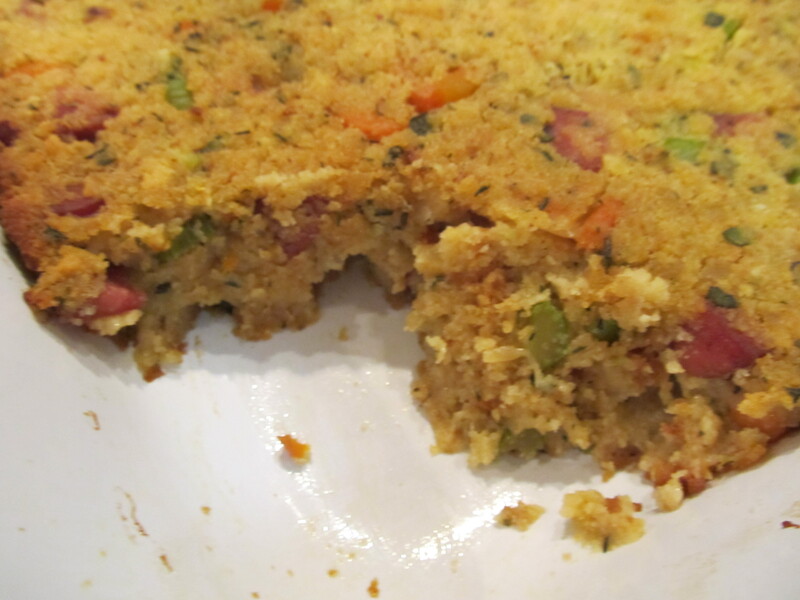 Our mom makes our grandmother’s stuffing – which is AWESOME, but very very simple. 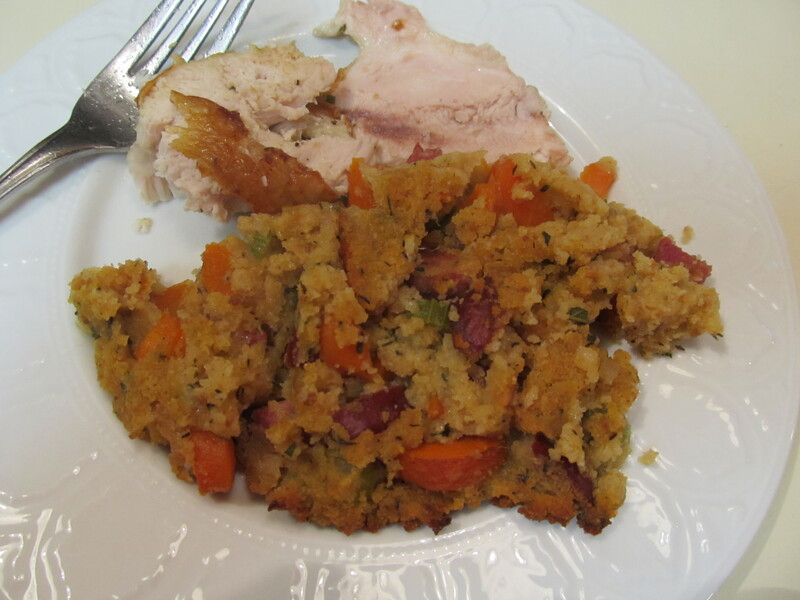 So to have another option of stuffing – and one that was so flavorful – was something else!! 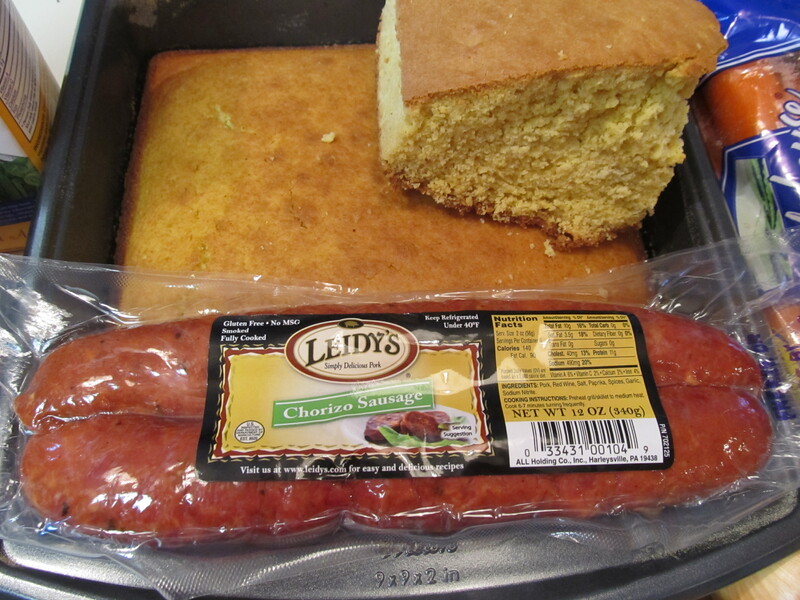 This cornbread is so easy to make. We make it at least 2-3 times a year. Robb keeps this recipe in his recipe-box and when we have it, he always makes it. The key ingredient is a spicy chorizo that adds a lil pizzazz to the recipe! 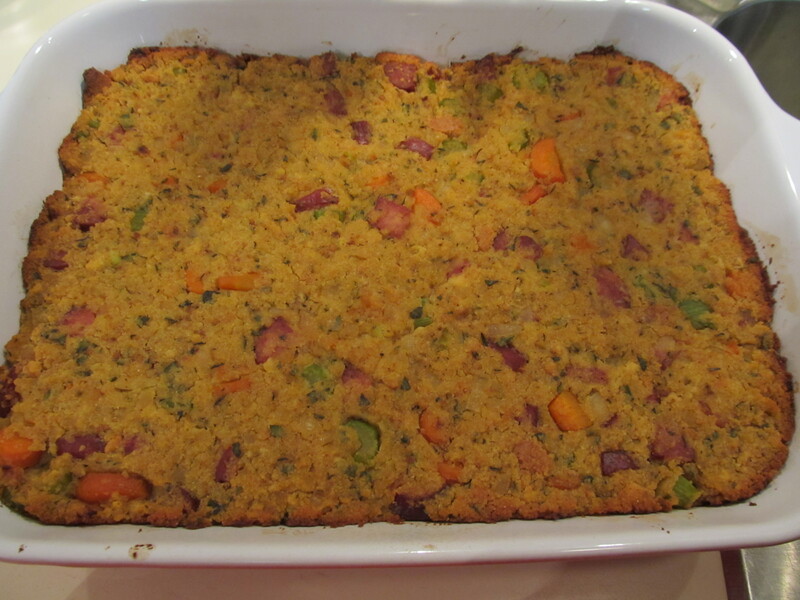 You can either make your own cornbread (beyond easy and what I like to do) or buy storebought cornbread and just let it air out and dry overnight. It mixes together so easily. And bakes to a nice golden brown. You can also bake it ahead of time and simply re-heat! 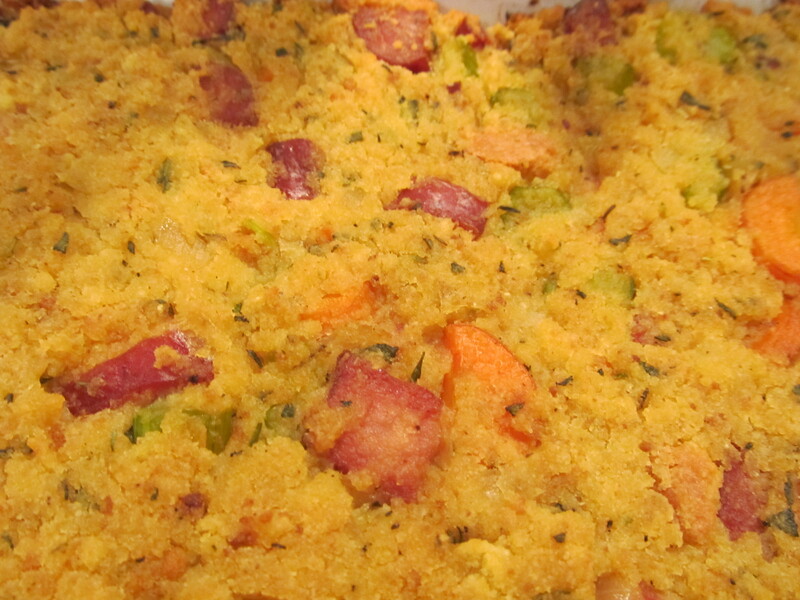 We have now adopted this stuffing as an official dish at Thanksgiving (accompanied by our grandmother’s stuffing, too, of course). Even when Marty was away 2 years ago on Thanksgiving, Robb stepped in and made his stuffing for our dinner with the rest of the family. Even if it’s not thanksgiving time, I suggest roasting a chicken (or turkey) and making this excellent stuffing to go along with it. 1) Melt the butter in a medium saucepan over medium-high heat. 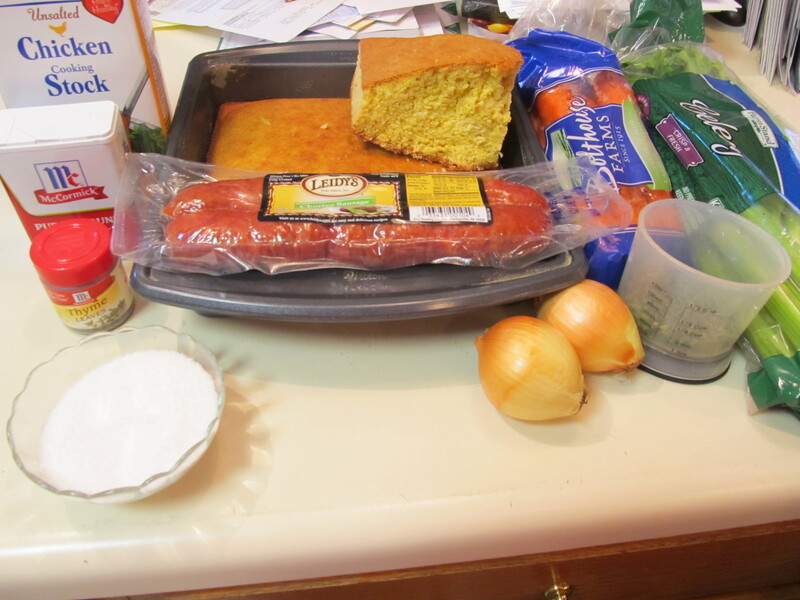 Add the chorizo and cook until golden brown, remove the chorizo to a plate lined with paper towels. 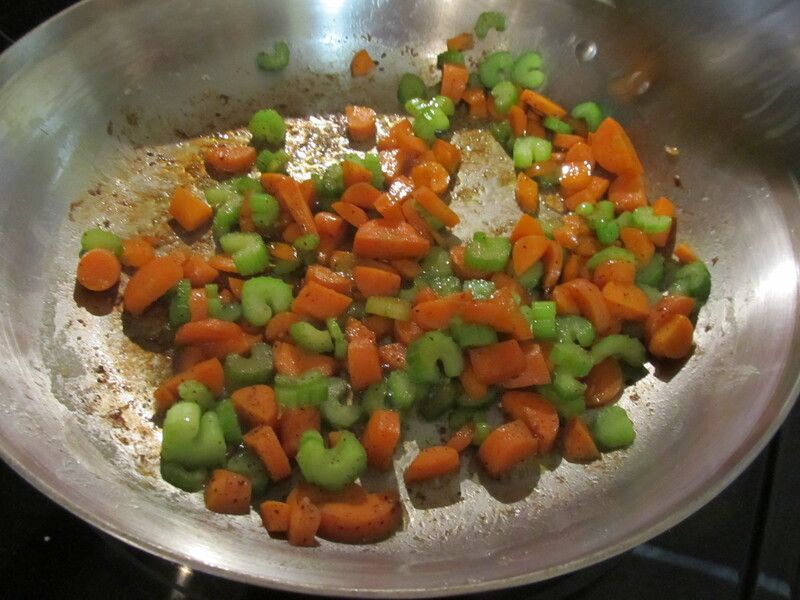 2) Add the onions, celery and carrot to the pan with the fat. 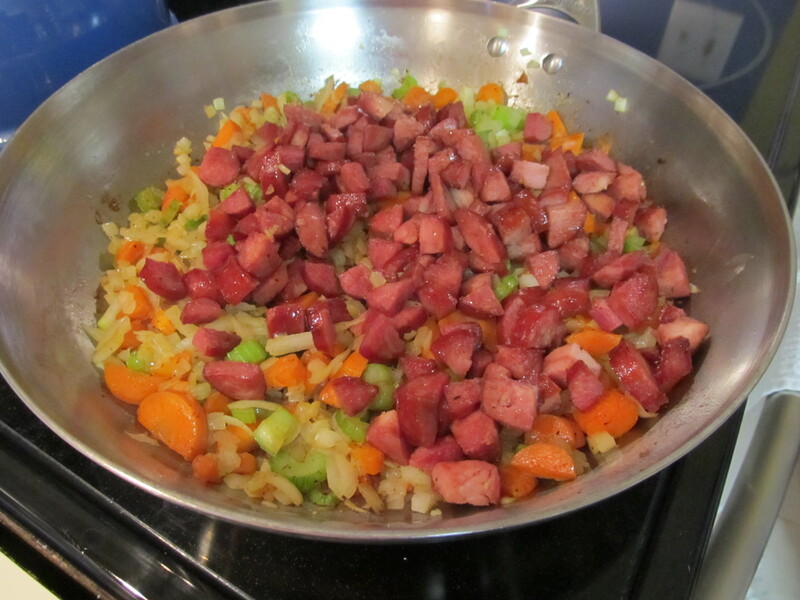 Season with salt and pepper and cook until soft then stir in the chorizo. 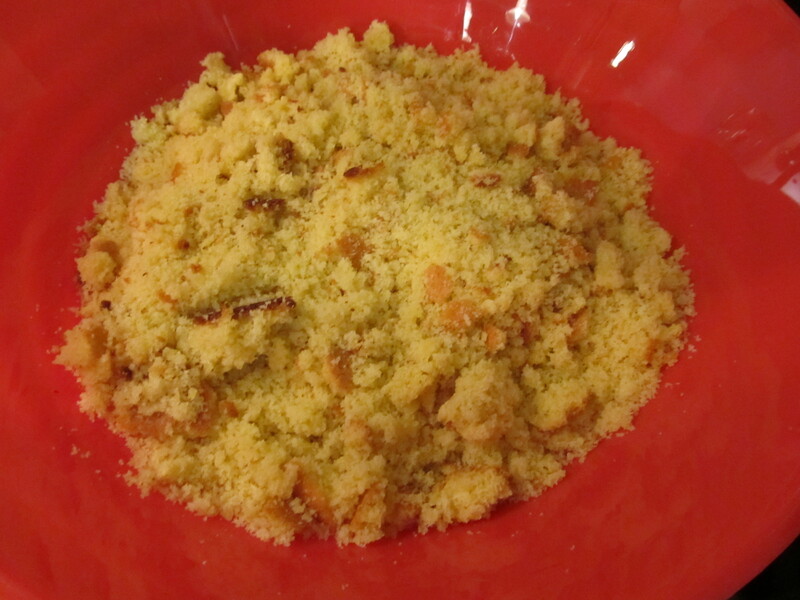 3) Place the cornbread in a large bowl. Add the onion mixture and two cups of the stock. The mixture should be quite wet; if it appears too dry, begin adding the remaining stock, a half cup at a time. Stir in the sage and thyme and season with salt and pepper to taste. 4) Scrape the mixture into a buttered 10-inch baking dish and bake in a 375 degree Fahrenheit oven until set and golden brown on top, about 30-40 minutes.